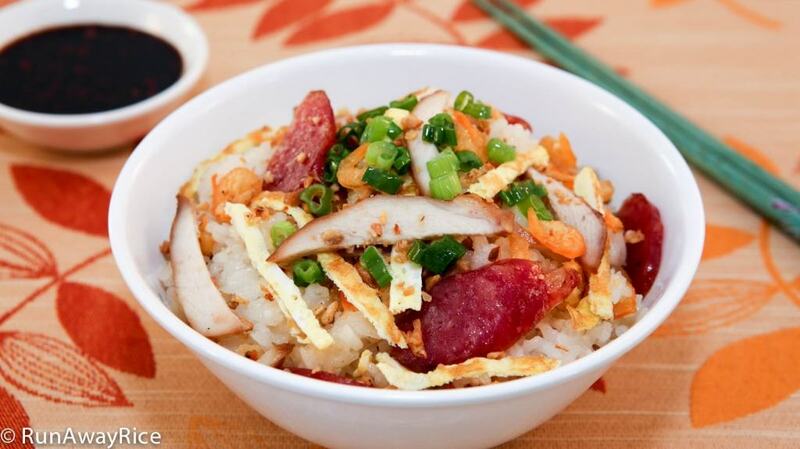 This is my shortcut recipe for Savory Sticky Rice also called Sticky Rice with Egg, Chinese Sausage, Shrimp, and Chicken. I call this dish Asian jambalaya because it’s a smattering of different ingredients but, put together, it is deliciously harmonious and satisfying. The traditional way of cooking the sticky rice is in a steamer. My shortcut method is to use a rice cooker, which of course, everyone has! Cook the shrimp, Chinese sausage and egg in a skillet. Add it all into the rice cooker along with some cooked chicken, mix together and you have an instant meal. It’s that simple! This hearty dish is great for breakfast, a snack or light meal. Consider making a batch and storing in individual portions. Now you have ready-to-eat meals for school or work. Enjoy! If you have time, make the Savory and Sweet Sautéed Chicken recipe I shared earlier. If you’re short on time, buy a rotisserie chicken from your deli. Make sure to cook the Chinese sausages thoroughly. Most brands of Chinese sausages are uncooked and you’ll see this on the label. When cooking in the water bath, if the water is evaporating before the cooking time is up, add more water. Know your sticky rice. Not all brands are created equally. Some brands of glutinous rice are very sticky and moist while other varieties are very dry when cooked using the 1:1 ratio for the rice and water. If you’re not sure, I recommend making a small test batch and then adjusting the water levels accordingly. This recipe does not require soaking the rice beforehand. If you are familiar with your brand of glutinous/sticky rice and would like to soak for a softer rice, go right ahead. Place dried shrimp in a bowl of warm water and soak for 15 minutes. Once rehydrated, rinse the shrimp with cool water, drain and then toss in a colander to shake off any excess water. Heat a skillet over Medium High heat and when hot, add 1/2 Tbsp vegetable oil. Add the shrimp and pan-fry for 3-4 minutes or until lightly toasted. 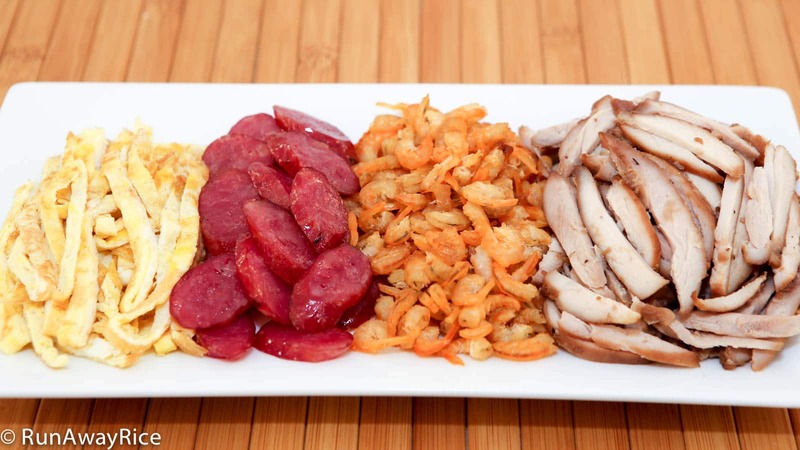 Remove from the skillet and set aside for now. Adjust the heat to Medium and add the Chinese sausages to the skillet. Add 1 cup water. Cook the sausages in the water bath for 10 minutes rotating every minute. (If the water is evaporating before the 10 minutes is up, add more water.) Once all the water is evaporated, cook the sausages for 1-2 minutes to brown them up. Remove from the skill and set aside. Beat the egg together with 1 Tbsp water until well combined. Heat a clean skillet over Medium heat and then add the beaten egg. Swirl the pan to distribute the egg mixture evenly. Cook for 2 minutes or until it’s no longer runny. Fold the egg in half and cook for another 30 seconds. Remove from heat. Wash and rinse sticky rice with cool water several times until the water is clear. Drain the water completely. Add 1/4 tsp salt and 2 cups water. Use a spoon or spatula to smooth out the rice into an even layer. Close the lid and set to Cook. Cut cooked chicken into thin strips or shred by hand. Cut the sausages at a slightly angle into thin slices. Cut the egg into thin strips. After the rice is done cooking, stir the rice and then add the shrimp, sausages, egg and chicken. Mix everything together. Close the lid and allow to cook for another 10 minutes. For the Scallion Oil, chop the green onions and place in a bowl. Drizzle with 1 Tbsp vegetable oil. Microwave on High for 20 seconds. 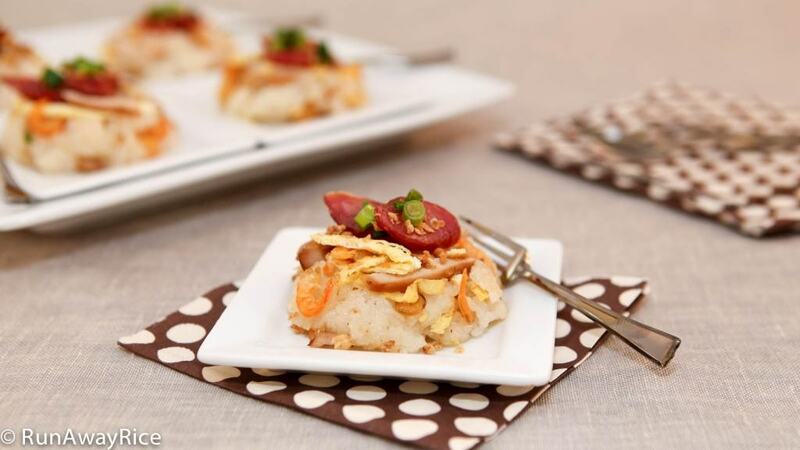 To serve, scoop out a generous amount of the Savory Sticky Rice. Top with the Scallion Oil and fried garlic. Serve with a sauce made of soy sauce and fresh-cut chilies or chili. Do you have a rice brand you would recommend without presoak for this dish? Thank you for posting the recipe. I curious to wait for your next recipe as ” xoi vo” . I like your recipes. It is so simple to make. This looks pretty good! I’m off now and am working on assembling everything I need to make this, though I don’t have a rice cooker! I’ve thought about getting one in the past but hadn’t done so but since I’m off I can go straight to Best Buy or maybe Wal Mart and pick one up! 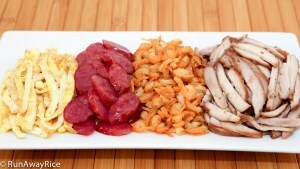 I just printed this one out and will take it to Global Foods and get the Chinese Sausage. Or I could just make another batch of the Nem Nuong sausage! Mmmmmmm!!!! Thanks for improving my cooking equipment! Will send you a pic of the results!